There are the obvious things to write about for a travel review in New York, famous sights, hotels, museums, shopping, the list goes on. But this has been done and I wanted to write something different, especially as this was my first visit to the city. Personally, wherever I travel and whatever time of year, food is a fundamental component to a successful trip. So I decided to write a guide on some of the very best and, albeit, quirky places to dine during a weekend break in the city. After all, great food can make you happy, it can open your senses to a rich history, glorious influences and it can make you explore and truly experience what that place has to offer. Through food alone a city, town or village can become a personality and I was intrigued to get to know New York’s. Sure I can tell you where to stay; I stayed at The Four Seasons on 57th Street, Madison Avenue, Upper East Side. You walk out of the hotel and it’s like being on Sloane Street, designer labels for about fifteen blocks. The location of the hotel is ideal for keen shoppers, but the great thing about choosing a Four Seasons is you don’t get any unexpected surprises, you know what you are going to get; impeccable service, superb concierge desk, excellent beds, it’s luxury without too much shine. In brief, the shopping is fabulous, there are the big department stores such as Bergdorf Goodman and Sacs Fifth Avenue, which you can spend hours in, but the really trendy areas are downtown in Soho and the Meatpacking District. However, all this everyone knows and shopping is only relative to the individual. It’s the same for site seeing, it may not be for everyone and we all know the things to do; take a tour round the Metropolitan Museum, go to the top of the Empire State Building or a boat ride around the Statue of Liberty. I shall leave it at that. So fellow foodies lets get to it shall we. New York is renowned for having the best restaurants in the world, but I was really excited to seek out some true grittiness, the hole in the wall restaurants that aren’t normally reviewed. Naturally I also wanted to compare the city’s very fine dining to London, so lets start uptown. 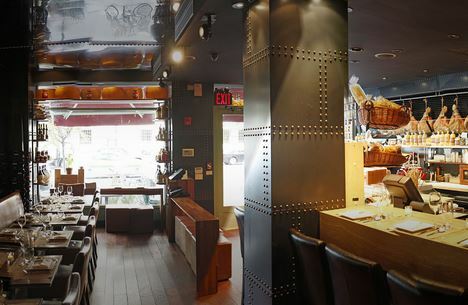 Marea, meaning ‘tide’ in Italian, is a high-end Italian fish restaurant located on Central Park South. Chef Michael White’s menu has taken regional foods of Italy and married them with glorious coastal cuisine. While Marea has received two Michelin stars, it doesn’t have that formal stuffiness one often associates with accredited restaurants. Thankfully the classic laid back Italian charm has resonated in the restaurant and its staff. The atmosphere can only be described as wonderfully tranquil; there is no pretention there. As you can imagine, the menu is divine and there are so many fabulous dishes that I struggled to come to a decision. Now, not so long ago, TV Chef Antony Bourdain reviewed this restaurant on his show No Reservations. He ordered the Ricci, sea urchin, lardo, sea salt, followed by the Fusilli, red wine braised octopus, bone marrow. My husband, who is obsessed with Bourdain, ordered the exact same thing. He wasn’t crazy about the starter but is still talking about the octopus and bone marrow. Personally, it wasn’t for me. My choice was the Polipo, octopus, chili oil, lemon, parsley, followed by the Funghi, wild mushrooms, parmigiano. The starter was first-class, utterly enchanting, and although the main was delightful, there was just too much on the plate. Although I am a self-proclaimed sugar addict, I couldn’t muster the courage to squeeze in a dessert, I was successfully defeated by a delicious two-course meal. It may sound cliché to say it, but what could be more American than ordering a burger and fries. 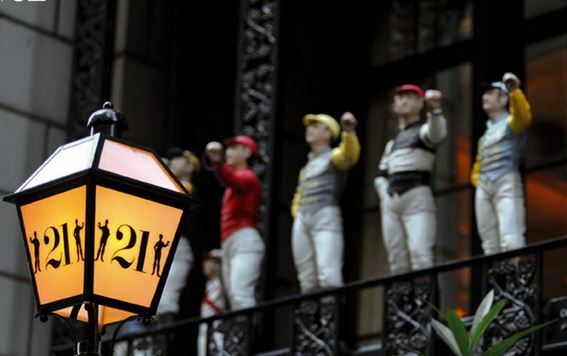 However, when you arrive at the ‘21’ Club, with its wrought-iron gates and colourful ornamental jockeys standing guard at the balcony, you would doubt that they even serve a burger. 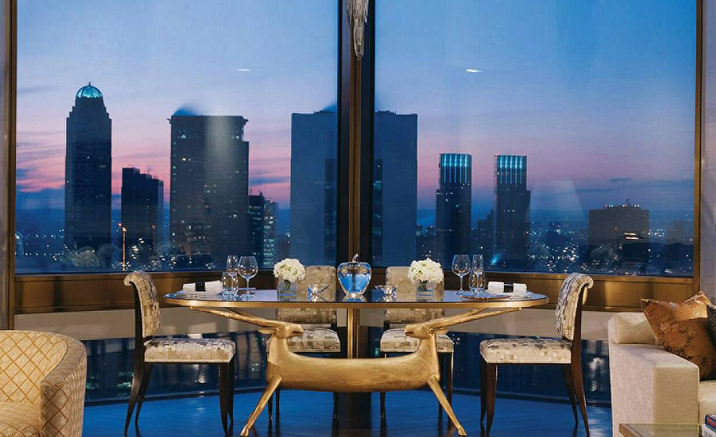 The dazzling 55-tabled palatial restaurant and bar has the ambiance of a private members club, but anyone can dine here as long as the men are wearing jackets. The club first opened in the 1930s with a fantastical disappearing bar and a secret wine cellar. Now, 80 years later, it still lures celebrities and highflying businessmen. The ceiling alone is definitely a unique attraction you just have to see. Every inch is cluttered with an array of sporting and industrial memorabilia, all donated by patrons who, like actors wanting their slab on the sidewalk of Hollywood Boulevard, just had to get their name up their. There’s a model of a PT-109 torpedo boat from President John F. Kennedy, a replica of Air Force One from President Clinton, tennis racquets from Chris Evert and John McEnroe, the list goes on and on. There is so much history in the room and each table, with its rich red leather chairs, has a story to tell. I was seated at table 7, the very same table that Ernest Hemmingway and Richard Nixon always sat at. To my right is table 8 where George Clooney likes to reside, while directly in front of me are tables 14 and 15, the popular choice of Dame Joan Collins and the late Frank Sinatra. As I looked around the large, richly decorated restaurant almost everyone, even the women, were eating the ‘21’ Burger. It is so popular that the New York Times had the ‘21’ Club in their ‘Top 30 Very Best Burgers’. So I guess it was obvious what I was going to order. There was something rather bizarre about being all dressed up in the middle of the day and ordering a $36.00 “haute” burger, but it also felt rather fantastic. I will spare you from the terrible dribble about how delectable the meat was; ok it was divine and melted in the mouth. If you are in the mood for a gourmet burger and excellent sides, such as the Pommes Soufflées and Grilled Asparagus, then the ‘21’ Club is for you. 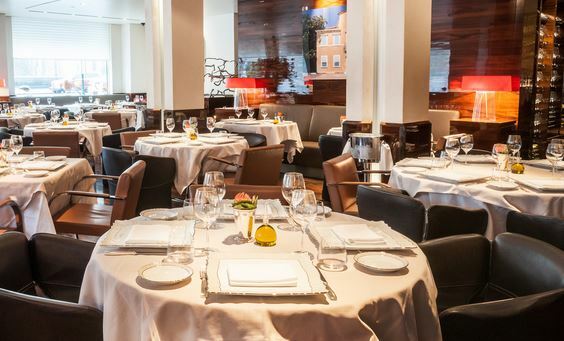 If not, then ‘21’ has a superb menu to choose from, the Dover Sole, Sea Scallops and Marine Lobster Salad were dishes I had to reluctantly bypass for the iconic burger. As for dessert, try the Profiteroles or, my favourite, the Saint-Domingue Chocolate Soufflés. 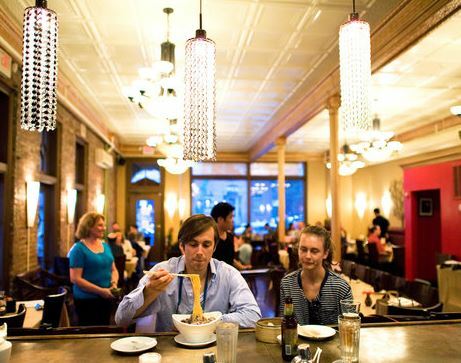 Salumeria Rossi is a true Tuscan restaurant. As you enter the black-mirrored L-shaped room the divine smell of cured meats, which hang at the counter near the entrance, flood your senses. The menu, all small plates, similar to the glorious Spanish tapas style of dining, will have your stomach growling. The wonderful array of small salads, meat dishes and mixed platters will come quickly; you will scarcely need your table for more than an hour. I love to dine this way, no fuss and just good food. Here are my standout dishes: Uovo Fritto, pan-fried egg with crispy rendered Porchetta, roasted potatoes and a tricolore salad, and the Salsicca, house made sausage of pork, fennel, garlic and spezie forte stewed with heirloom beans and tomatoes, were both heavenly, while the Porchetta Sandwich, pork loin sandwich with provolone, local pickles and Calabrese pepper bomba sauce, which was so ridiculously good I could have ordered another plate, but alas I was too full to do so. I did, however, manage to indulge in the Chocolate Mousse, which I sometimes think looks so plain on a menu but is often a glorious surprise when one does order it. I have to hold my hands up and say that I have never had Dim Sum, but it was something I wanted to try while I was in New York. Having done some research on the best Dim Sum in Chinatown, Dim Sum Go Go was at the top of my list. When the taxi pulled over it did feel as though I was a long way from home. The busy street was packed with Chinese restaurants and food stalls, but amongst the chaos was Dim Sum Go Go. The objectionable bright red sign and canteen like complexion couldn’t be missed but the queue coming out of the door was promising. Thankfully there was just a 10 minute wait before I was seated. The crowd was a true mix, from families with small children, foreigners, locals and plenty of rather expensive handbags littering the floor. The menu is extensive but the highlights for me were the Bamboo Heart Soup, Sweet Pork Dumplings, which were seriously delicious, Shrimp Dumplings and some Pak Choi to finish. I also loved that they serve you green tea as their free beverage. Service was excellent. One thing that I always associate with the streets of New York is the hot dog stands. Yes, it’s a Germanic influence, but New York has adopted the Frankfurt as its own. 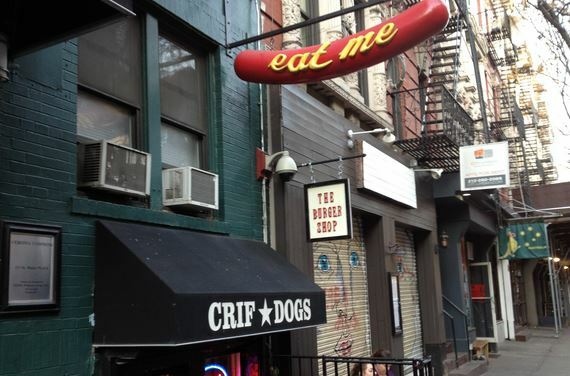 Crif Dog is located on St Marks Place in the East Village. The tiny underground restaurant is on another level to your traditional hot dog stand. I’m not usually one for greasy food, but if you are out late (they are open until 4am Friday and Saturday) or perhaps a little hung over, Crif Dog is where you should be heading. You walk down the narrow steps and hip-hop music bounces off the walls, the smell of deep-fired hotdogs is comforting and so is the extended menu. I decide to go for a Crif Dog favourite, the Spicy Redneck Hotdog; a house dog, bacon wrapped with chilli, coleslaw and jalapenos. It’s so wrong but it tastes so good.